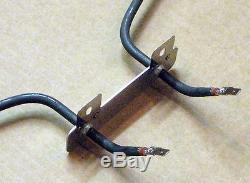 WB44K10005-10 for GE General Electric Range Oven Bake Unit Lower Heating Element. 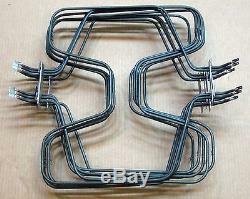 Replacement bake element part number WB44K10005-10. Dimensions: 17-1/4" Width, from Side to Side at the widest spot 15 1/2" Length, from mounting bracket to back 2-3/8" From end of terminal to the mounting bracket (measuring up at an angle) 2 5/8" between each terminal, Terminals are male spade type Calrod is bent up at then end towards 2 mounting holes 2585 Watts 240 Volts Replacement for numbers WB44K10005, WB44K10001. It is designed to fit specific General Electric manufactured range models including Hotpoint and RCA. Check out my other items. 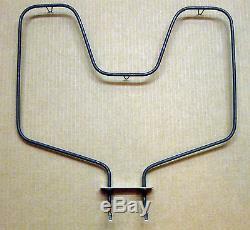 The item "WB44K10005-10 for GE General Electric Range Oven Bake Unit Lower Heating Element" is in sale since Tuesday, December 1, 2015. This item is in the category "Home & Garden\Major Appliances\Ranges & Cooking Appliances\Parts & Accessories".